A mayor is the elected leader of a municipal government. In the strong mayor form of government, the mayor is the chief executive officer of the city. In the council-manager form of government, the mayor is the leader of the city council but has no greater official authority than any other council member. Within the strong mayor form of government, the mayor acts as a chief executive officer. Much like a US president at the federal level, the executive authority within the city government is vested in the mayor. This form of local government is most often used in larger cities where mayors need to be more connected to state and federal politicians and public administrators. The mayor is the public face of the city much like the president is the face of the United States. During natural and man-made disasters, the mayor is out front giving updates to those impacted by the disaster as well as the to the national and international press. For example, New Orleans Mayor Ray Nagin was constantly in the news in the aftermath of Hurricane Katrina in 2005. Another incident of a mayor in front of the press during a disaster was New York City Mayor Rudy Giuliani after the terrorist attacks of September 11, 2001. City staff members ultimately report to the mayor. As the chief administrator, the mayor has the power to hire and fire personnel. In some strong mayor cities, the city council has the power to confirm or reject mayoral appointments. A mayor in the council-manager system is the symbolic head of the city. In reality, the mayor is a first among equals on the city council. 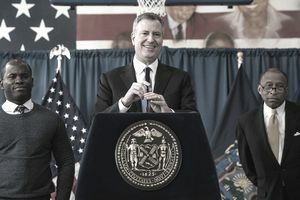 The mayor must use influence more than official power in order to drive the city’s policy agenda. The city council under the mayor’s leadership is the legislative body for the city while the city manager is the executive. The city council hires the manager to implement the laws and policies it adopts. The manager directs the staff in carrying out the city’s day-to-day operations. The manager also serves as the council’s top policy advisor. When the city manager needs to communicate critical information to the city council, the mayor is the first person the manager contacts. From there, the manager may contact the other council members, or the mayor may disseminate the information. It depends on the relationships between the mayor, manager, and council members. Examples of critical information may include an officer-involved shooting, a department head’s resignation, rumors of an imminent lawsuit against the city, or a workplace safety accident. Grover Cleveland served as the mayor of Buffalo, New York, from 1881 to 1883. He was the 22nd and 24th president serving 1885-1889 and 1893-1897. Andrew Johnson served as the mayor of Greeneville, Tennessee, from 1830 to 1883. He was the 17th president serving 1865-1869. Calvin Coolidge served as the mayor of Northampton, Massachusetts, from 1910 to 1911. He was the 30th president serving 1923-1929. Before Sarah Palin was a vice presidential candidate and governor of Alaska, she was mayor of Wasilla, Alaska. She served as mayor between 1996 and 2002. Actor and film director Clint Eastwood served as mayor of Carmel-By-The-Sea, California between 1986 and 1988. Musician Sonny Bono served as the mayor of Palm Springs, California, between 1988 and 1992. He served in the US House of Representatives from 1995 to his death in 1998. Before hosting his low-brow television talk show, Jerry Springer was mayor of Cincinnati, Ohio. Springer served as mayor for a one-year term between 1977 and 1978. Springer served on the city council 1971-1974 and 1975-1978 with a resignation between the two stints.